Competition for business runs high in New York. So, while many businesses flock to guerilla tactics or media buys, some are still desperate for unique attention on a not-so-unique budget. At first this appeared to be some kind of artsy-street-vandalism-statement, but no. Equipped with a Kinko's and a pair of scissors, this Italian joint became an in-house ad agency in minutes. "Looking at these pictures, one cannot help but wonder why more businesses don't advertise themselves like this, like, "The Biggest Laugh You'll Have West of Auschwitz! 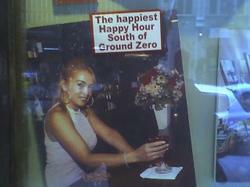 ", because nothing says "happy" like "the tragic death of thousands of New Yorkers"."